- Bell in the inkwell. When you move the note, the bell changes color from copper to green. Maybe George Washington can use some of these to pay for his overdue library books. Ever want a crossbow but don’t want to go out and actually spend hundreds on a dangerous weapon? Now you can make one with everyday household items using these simple steps! From John Austin’s book: Mini Weapons of Mass Destruction. Just Like Mom - Fergie Olver is a Perv!!! from HaggardMike on Vimeo. youtube.com — The guy is soo creepy! I can't believe this went on the air and nobody said a word..Very weird times those 70's and 80's. 5th Grade Baller Jaylin Fleming is from Chicago. Since Fleming is only 5′1″ tall, and he generally plays with kids up to nearly twice his age, he needs to be quick, and he needs to have handles. Mad handles. Who better for a 5th grader to look up to than Derrick Rose from his hometown Chicago Bulls. I hear Derrick Rose has a decent handle of his own, right? The ‘mini-me’ comparisons are bound to happen between Rose and Fleming, especially after Rose recently agreed to meet and shoot around with the little fella. But Fleming is nothing like an average kid his age. He is puttin’ in work on the hardwood. He lives, breathes, sleeps, and eats nothing but hoops. We thought we were hoop heads here at The Hoop Doctors, but we got nothing on this kids love for the game. And it’s starting to pay off already for him. Aside from already being a YouTube sensation for the following video giving you a sneak peek into his lifestyle and work ethic, Jaylin is rated by many scouts as the top player for his age in the entire country. I wouldn’t be surprised if college programs already have this kid on their radar a whopping 8 years shy of when Jaylin will be ready to sign a letter of intent. A collection of the most beautiful surfing action pics ever. youtube.com — Watch this small little girl sing amazing grace better than anyone I have ever heard. This is truly inspiring and amazing. You won't believe your ears! 8track.taylorhawkins.com — Taylor Hawkins (Foo Fighters) is streaming his new album in 8-Track quality. Compete with tape compression, hissing, and clicks. Drag the tape to the slot! 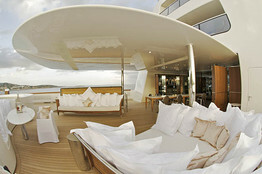 The yacht's three pools include a high-powered jet pool for laps that can be switched from salt to fresh water. BARBADOS—At the top of a spiral staircase lined with scalloped, silver-leaf walls (the banister cost $60,000) is a door accessible by a fingerprint security system. It opens to an all-white, 2,583-square-foot master suite wrapped in bomb-proof, 44-milimeter glass. There, a king-sized bed sits on a giant platter that rotates with the press of a silver button. Another set of buttons rotates the bed itself. The combination of the rotating bed and the rotating platter allows limitless angles for watching the sunset, sunrise or the 60-inch plasma TV, which retracts from the ceiling. Designed by Philippe Starck, the "A" has quickly become the most loved and loathed ship on the sea. WSJ's Robert Frank takes an exclusive tour of Andrey Melnichenko's 394-foot mega-yacht. And of course, everything's afloat. In the battle among Russia's billionaires for yacht supremacy, Roman Abramovich's upcoming 540-foot Eclipse may soon become the biggest, but Andrey Melnichenko's 394-foot "A" has become the most talked-about yacht on the seas. With its radical shape—more sleek submarine than boxy pleasure boat—and reams of custom parts and finishes (including bath knobs costing $40,000 apiece), "A" is a conspicuous marker of an ocean-going plutocracy that's largely been untouched by the recession. The boat, designed by Philippe Starck and completed in mid-2008 for more than $300 million, has spawned a flotilla of copycats emulating its low-slung hull and design scheme. Numerous companies involved in its construction went bankrupt, done in by the novelty of the project and the level of customization required. For all its fame, "A" remains a bit mysterious. Its owner, a 38-year-old banking, steel and fertilizer czar, is intensely private and requires all his construction crew and staff to sign strict confidentiality agreements (he declined comment for this article). He and his wife only rarely entertain on board, and few public images of the boat's interior exist. Dirk Kloosterman, "A"'s project manager and a veteran of the world's largest yachts, recently provided an exclusive tour of the boat's 23,600 square feet of living space. The boat's interior departs dramatically from most conventions of yacht design. Instead of the usual overstuffed couches and mahogany walls, there are Baccarat-crystal tables, shiny white finishes and polished silver, a kind of Manhattan-loft-meets-Vegas aesthetic. Many of the rooms have floor-to-ceiling mirrors, which Mr. Starck says have a built-in "mathematical beauty" that also refer to the "mathematical genius" of Mr. Melnichenko. A look at some of the world's largest and most ostentatious yachts. The walls of one room are covered in white sting-ray hides, while another is covered in hand-stitched calf's leather. The main deck features two Michel Haillard chairs made from alligator hides and Kudo horns. Known for his mischievous streak, Mr. Starck outfitted "A" with risqué touches like the suite dubbed the "nookie room" by the crew, with its white circular bed with padded walls and a ceiling-mounted TV. Mr. Starck says that while most megayachts are "vulgar" statements of wealth and power, "A" was designed to be in harmony with the sea and nature. "This boat has elegance and intelligence, it is not trying to show the money," he adds. 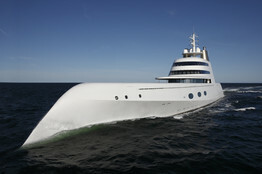 As with many Russian-owned yachts, "A" is highly secure. Its rounded exterior and knife-like hull make it difficult for intruders to board. It has 44 security cameras and more than a dozen exterior cameras fitted with motion-detection systems and a night-vision infrared system. It is also designed to outrun threats: Twin, high-speed diesel engines deliver 24,000 horsepower and push the 5,959-gross-ton ship to 24 knots, roughly a third faster than most boats its size. The boat, which is stabilized by fiber-optic gyroscopes and four giant motorized flaps, is rumored to also be equipped with a pod-like escape system, but the staff declined to comment. A transom door in the rear of the boat, which swings with open to become a swim deck, is fitted with so many hydraulics, locking pins, rotating stairs and electronics that it cost around $25 million to build. The company that made it eventually went bankrupt, along with the company that made the bomb-proof wrap-around glass encasing the master suite and the company that built the hydraulic gangways. The ship's two main landing boats are mini-yachts themselves, stretching to 36 feet, boasting plush interiors and costing more than $1 million each. There's little sign that the billionaire boat boom is ending. The recession has certainly hit the "middle-class" yacht market, as banks cut back on boat loans and mere millionaires struggle to rebuild their fortunes. Orders for boats of more than 80 feet fell to 753 last year from 992 in 2008, according to Showboats International magazine. 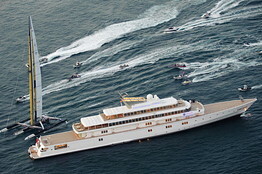 Yet orders for superyachts, or those more than 250 feet, were actually up more than 20% in 2009, according to Showboats. 'A' has an unusual, swoopy design, a low-slung hull and twin engines that deliver 24,000 horsepower. "A" has a crew of between 35 to 37 people, including stewards and stewardesses, mechanical engineers, security staff, housekeepers, deck hands, galley crew and chefs. The crew also has specialists for surfing, jet skiing, water skiing and cycling. All of the crew wear Starck-designed uniforms—crisp white dress shirts and white pants for daytime, and tight, black T-shirts and slacks for evening. The boat costs over $20 million a year to maintain; Filling the gas tank costs more than $500,000. There are many discussion groups and forums about "A" online, with titles like "The Ugliest Yacht in the World" and "Should Philippe Starck Design Boats?" Debates can get heated: On the "Insider's Guide to St. Bart's"—a Web site frequented by vacationers on the upscale Caribbean island—dozens of "A" spotters tracked the boat's daily movements. "That's pretty Cool!," wrote one St. Bart's vacationer. "Finally a real designer yacht!". Added another: "Who would call their Yacht 'The A'? Seems like you're setting yourself up big time." ("A" stands for both Andrey and Aleksandra, Mr. Melnichenko's Serbian-born supermodel wife). Some yacht designers and brokers describe "A" as too futuristic and aggressive for the leisurely world of yachting. "Initially I was very skeptical," says Jonathan Beckett, chief executive of London-based Burgess, the yacht broker. "When you just see photos, it's a very strange-looking boat. But when I saw it cruising in the Caribbean this year, I have to say I was impressed. It's a very exciting boat to watch. It's simply unlike anything that's ever been done before." Crew members often joke about the Melnichenkos' penchant for the spontaneous, with frequent changes in itinerary or travel. The boat doesn't spend much time in any one port, since Mr. Melnichenko prefers to roam the seas for weeks at a time. Last year he spent several months in the Mediterranean; this year he's mainly in the Caribbean. "The fun thing about working on 'A' is you never know what the next hour will bring," says Mr. Kloosterman, "A's" project manager. "This boat is all about the unexpected." random804 — December 10, 2009 — Australian comedy group 'Axis Of Awesome' perform a sketch from the 2009 Melbourne International Comedy Festival. Footage courtesy of Network Ten Australia. See http://www.axisofawesome.net/ for more details of the comedy trio including Jordan Raskopoulos, Lee Naimo, & Benny Davis.